This card is a CASE from LeeAnn Greff, and I love it! The wash and vellum piece is actually full of little punched 'confettis' that gives the card a ton of movement and colour. A great card for kids or the young at heart for sure. Cut out a piece of white card stock using the oval framelits and the Big Shot. Cut out a piece of colored card stock (your choice of color) using the Banner framelits and the Big Shot. Emboss another piece of colored card stock using the polka dot embossing folder. Stamp the image from “Tag It” using markers to get a multicolored image onto the oval cardstock. Pierce an oval into the piece of vellum using the piercing tool, mat, and template. 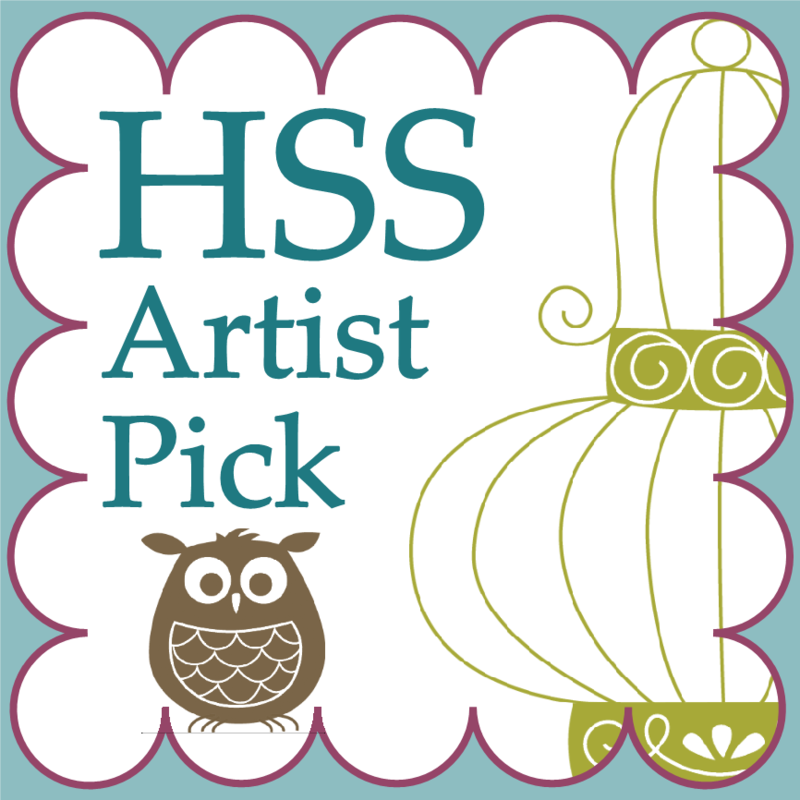 Punch a variety of small shapes from colored cardstock scraps and place on the piece of white card stock. Overlay the vellum onto the white cardstock and confetti pieces. Adhere together using washi tape. Adhere the stamped oval to the front of the vellum piece. Adhere the embossed panel to the card front. Adhere the banner to the card front using dimensionals on one end. Adhere the vellum shaker to the card front using dimensionals. Adhere a white panel to the inside of the card. 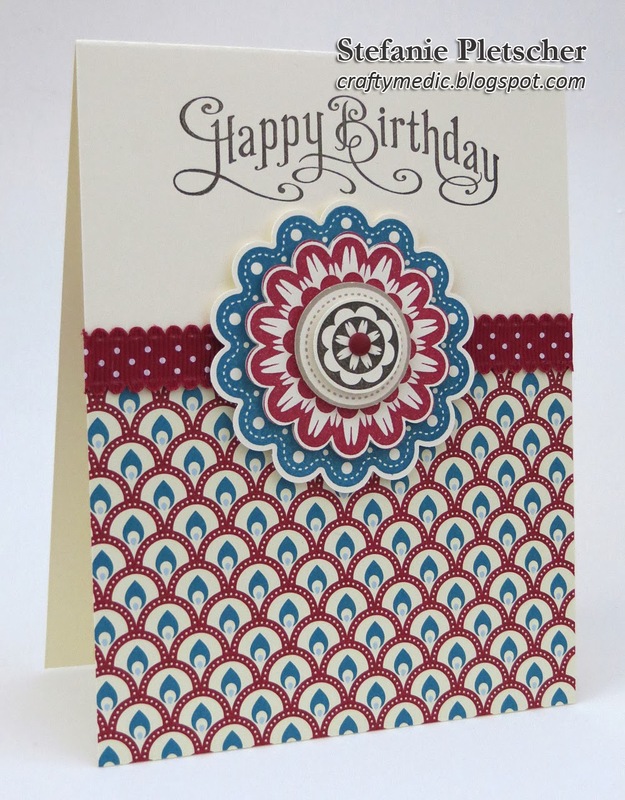 Add a rhinestone to the card front. I've featured posts on card buffets in the past, so I figured I'd do so again. In the past week I've had three Birthday Card Buffets, and another one is planned for March. The ones I've done in the past have been Christmas Card themed. The basic concept is you come by wherever the vent is held (in this case my buildings' common room). You can then pick from a variety of cards, you pick up the paper and embellishments, and make the card! The only thing you need to bring is your own adhesive, all other tools are provided. Between two separate days, I had twelve women come by and make more than 100 cards! We had an absolute blast and got a lot of cards checked off our "to make list". If you'd like to host or attend a card buffet, give me a shout and I'll make it happen! I still have the Birthday Card one going for now, and will be rolling out a Thank You Card version by April. To see some of the cards from the last buffets, check back on the blog over the next month or so, they will be featured! For this card I started off with a piece of DSP from the retired Festival of Prints, but you could use any DSP for it, and even swap out the Quintessential Flower stamp for a different multilayered stamp. Stamp the “Quintessential Flower” image four times in Island Indigo, Crumb Cake, Early Espresso, and Cherry Cobbler. Stamp the sentiment from “Perfectly Penned” across the top of the card front. Punch out the pieces of flower with coordinating punches. Adhere the Designer Series Paper to the card front. Adhere the strip of ribbon around the card, leaving a small gap in the middle of the card front. Adhere a candy dot to the center of the flower. .. come on! No? You aren't singing along? OK that's fine, you can still party with me! Sale-A-Bration starts today, which is SUPER exciting. Demonstrators are lucky enough to get a sneak peek and pre-order the goodies, which means I've had these delicious products in my hands for a while, and even incorporated them into my Birthday Card Buffet! 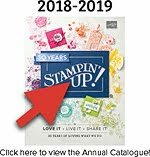 If you're not familiar with SAB, for every $60 you spend on any Stampin' Up! products during this promotion, you get to pick am exclusive product free! These stamp sets, papers, and other goodies are ONLY available to be earned for free, you can't buy them. Check out the full lineup in the brochure here. Here's a card I made using some designer series paper and embellishments from the SAB lineup for the Birthday Card Buffets. Details and instructions on this project will be coming soon! There's some other awesome new products in the store too, so head over to the store and check them out, or give me a shout to find out more! I'm back on the blogging bandwagon! Woo hoo! These next cards are from my Birthday Card Buffets, which were a riot. I'm planning a different card buffet quarterly now, so if you'd like to host or join one, give me a shout! For this card, I actually used some paper that came with one of my My Paper Pumpkin kits. I liked it because it has a white core, allowing the clouds to really pop. Emboss the grey layer with the cloudy embossing folder. Distress the embossing using the sanding tool and clean up using the dust buddy. Adhere the grey layer to the card front. Punch the end of the white layer with the tag topper punch. Thread a piece of ribbon through the top of the tag and tie off with bakers twine. Stamp the tag with images from “Up, Up & Away” using Pool Party and Not Quite Navy inks. Stamp off the image on scrap paper to create a lighter image. You can also stamp the same images on the panel for the inside. Adhere the panel to the inside of the card. Adhere six pearls to the card front. I've been terrible at one of my goals for 2014 already. I've been so busy with my day job that I haven't had enough time to create new content, and my pre-written posts ran out on me. I promise I'm coming out with new posts SOON, and they're worth the wait! I'm reprising the format of some of my most popular posts with new cards. I'll also be featuring some of the awesome new products from the Occasions and Sale-A-Bration catalogues. 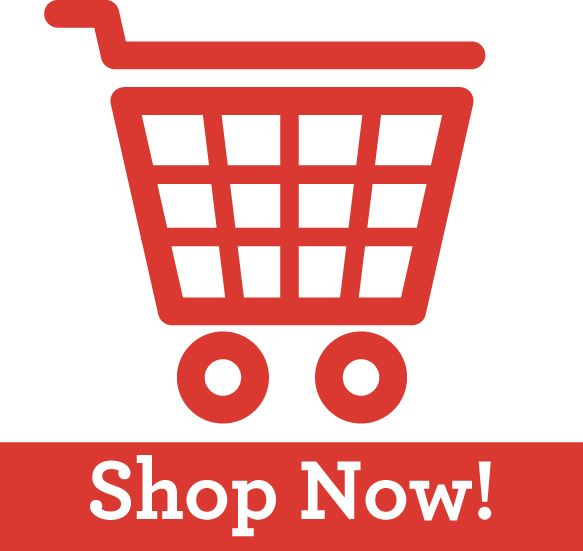 For now, you can go and check them out in the online store! Sorry for the late post today, I'd forgotten I ran out of pre-planned posts and had to work. Luckily my My Paper Pumpkin kit for January (called Love Notes) arrived today, and after work I had a moment to whip up these four cards! I used all four card bases, two doilies (there was four in the kit), and one sheet of stickers (there was two) along with the stamps and ink pad that came in the kit. I also got a special free gift in my kit this month, a super nice surprise! These cards are out to some special folks in my life to remind them that while they may be small, they're special to me! 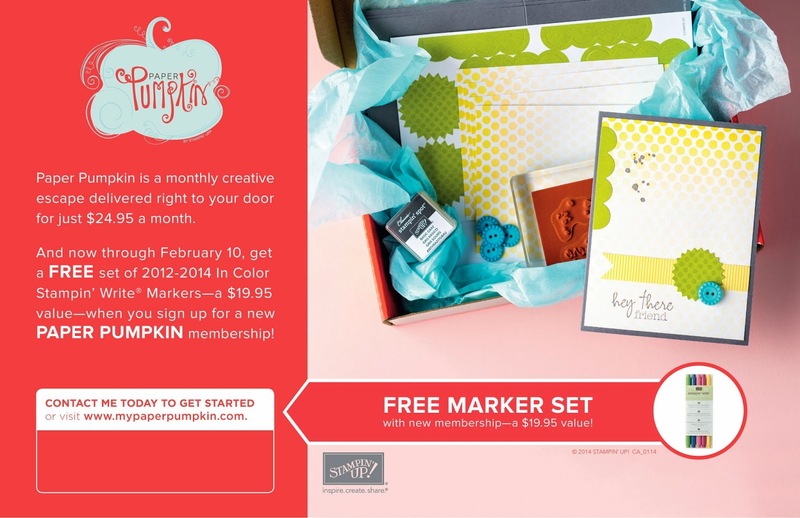 If you'd like to get a monthly craft kit delivered to your door, now is the perfect time! Sign up now for a My Paper Pumpkin subscription and you'll get a FREE set of In Color markers! Click here to find out more or to sign up today. 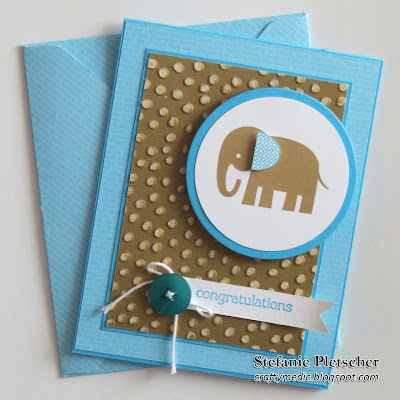 Another baby born to dear friends, another baby card! This one is CASEd from Rita, this card uses Tempting Turquoise and Baked Brown Sugar in various forms and textures. The embossing folder is one of the awesome new exclusive products you can get for FREE during Sale-A-Bration! The only way to get this, and a handful of other products, is to place an order (minimum $60) between January 28 and March 31. I've got more previews coming before then too! If you haven't heard about My Paper Pumpkin yet, you're missing out. As a subscriber, every month you get a box full of goodies to make a project. Sometimes it's a set of cards, sometimes it's a mini-scrapbook, sometimes it's a decor project. There's all kinds of fun stamps and supplies in these boxes, and this month it's gotten even better! If you sign up before February 10th you'll also get a FREE set of In Color markers (five of my all time favourite colours too!). You'll get your first kit in February, the starter kit you see above, which includes a FREE clear block you'll be able to use every month. Click here or on the picture above to sign up today! Make sure I'm listed as your demonstrator and you'll get some free goodies from me too. Check out some of my previous My Paper Pumpkin posts, showing some of the previous kits here, here, here and here! I made this set of cards as a Christmas gift to my sister. The cards themselves are fun, but nothing crazy. 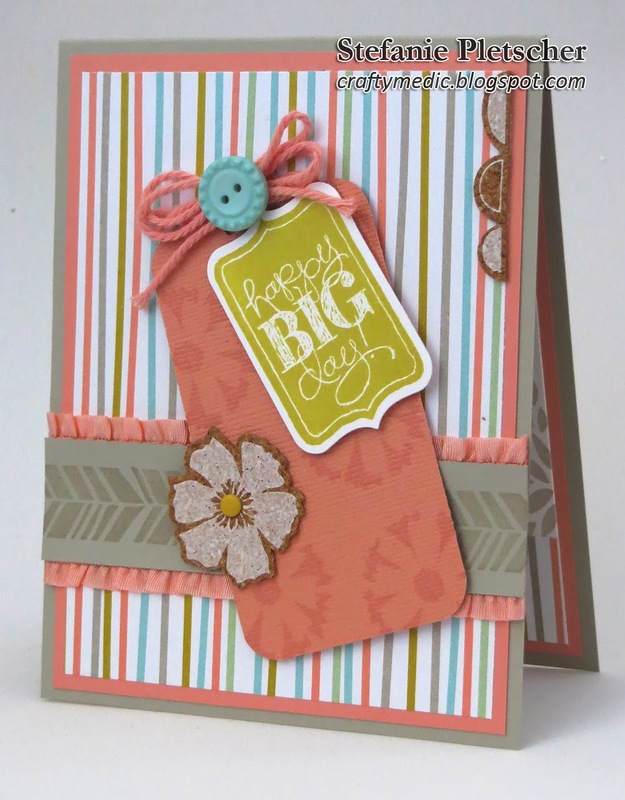 She'll have the choice of mix and matching sentiments, mats, and colors to make her own cards. See the stamps? I made those myself! I traced images I found online onto the rubber and then carved them out. It's super fun and easy with the Undefined Stamp Carving Kits, which include all the rubber and tools to make four of your own stamps (or more depending on how you use them). A refill kit is also available. I added a black Stampin' Spot and some dimensionals I swiped from a My Paper Pumpkin kit, tucked it all in one of the wood mount stamp cases and voila! 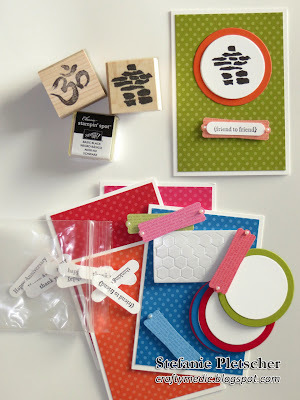 Custom stamp and card kit made easy! 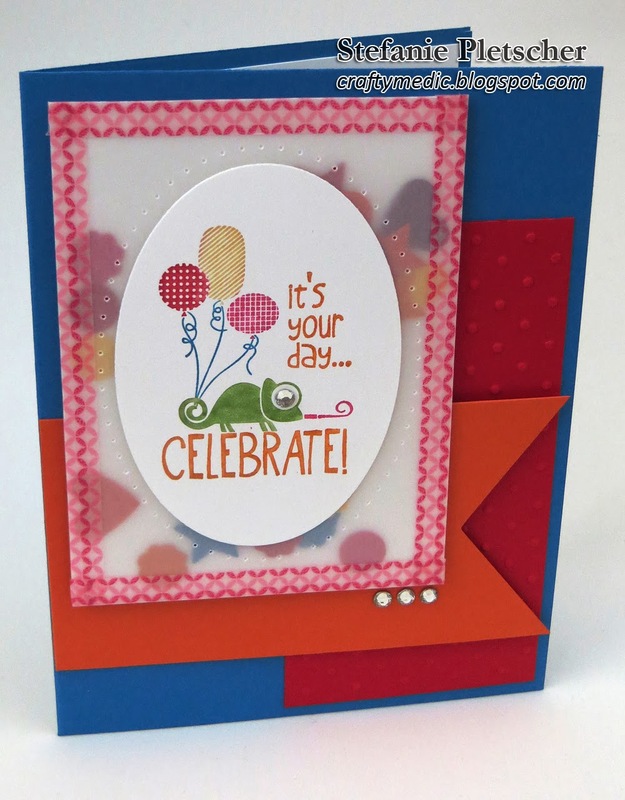 This card is a CASE from Mui Hoang and features three of my favorite Sale-A-Bration products and a great designer series paper stack (Fresh Prints) from the Occasions Catalogue. The sentiment is one of four from a set you will only be able to get for FREE during SAB. The banner stamps and punch (yes I said Banner PUNCH) are also some of these awesome free products you can earn. I love all of them and can't get enough! Welcome Baby Girl and Giveaway! Because I love my fans and it's my birthday week, I'm going to do a bit of a give away. Comment below with which supplies you think I forgot to include in the first picture and you might win a special goodie bag of Stampin' Up! products! I can only ship to Canadian addresses, so unfortunately this is only open to Canadian residents. I'll announce the winner next week! See the glimmer paper? It doesn't come in green. So I used a reinker and a sponge to make it the color I wanted! I ended up with ink everywhere, including on the front of the card in places I didn't want it. But no worries, I covered up the smudges with rhinestones! If you want to start making your own birthday (and more) cards, why not host or attend one of my Birthday Card Buffets to get a head start on your year? Contact me for more information. I'm excited for this year, there's a lot of change and a lot of good in my life, both personally and professionally. 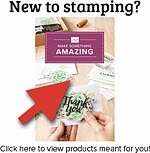 One of the things I'm doing is working on expanding my Stampin' Up! involvement and business. More regular blog posts! I'm working hard to post three times a week, probably Monday, Wednesday, and Friday. This will be a mix of tutorial style posts (like from my Countdown to Christmas series), information about SU specials, and just sharing some of my favorite projects and products. More workshops! I'm going to be putting aside more time for prepping and hosting workshops of all kinds. So whether you'd like to host or attend, there will be time for you! Giveaways! Some of you saw my Christmas mini-card giveaway, and that's only the start. Coming up this year there will be giveaways of both finished projects (open to anyone) and actual product (open only to Canadian residents). I couldn't do it without my amazing friends, family, customers, and demonstrator group, so you'll be seeing and hearing more about them too!